Hina and Rina worked the bulk of this match after Kashima made the, perhaps wise, decision to not take them on at the same time. She was quite happy to sit in the corner and leave them to it before coming in and asserting her dominance by tapping Rina out with a Boston Crab. It was what you’d expect with the twins involved, a short match with decent performances, but nothing special. The latest international recruit to Hana’s gang is Goya Kong who is over from Mexico. Pre-match she gave a very impassioned promo (in Spanish, so I’ve no idea what she said) to which even Kimura looked a bit scared. Goya then kicked off the match by taking a sumo stance complete with stomps which shook the ring. Jungle attempted to emulate causing Iida (her ever faithful partner), to leap in the air as if the power of Kyona’s stomps had sent her flying. It was a beautiful – and genuinely funny – moment of camaraderie. Once we got into the action, it was set-up as a showcase for the newbie. Kong towered over Jungle, so when Iida entered the ring, she looked like a monster. To describe Goya Kong as physically dominant doesn’t do it justice; she was on a different planet from JAN.
Not that either Iida or Kyona appeared intimidated. They tried, working together and using their speed to take the giant off her feet. Unfortunately, it wasn’t to be. A Hana suplex followed by a Kong splash left Iida to take the three. It all served as a solid introduction for Goya Kong who, at the very least, brings something different to the Stardom roster. There wasn’t enough here for me to get a handle on exactly how good she is, so we’ll have to wait and see. STARS’ pre-match promo was wonderfully awkward as Tam rambled on for a bit, declared the returning Xia Brookside the pretty champion, and generally lost track of whatever point it was she was trying to make (if there ever was one). They extended this bumbling chemistry into the ring by tying streamers into their hair before the match started. That kicked off a contest which might not go down as a wrestling classic but was a lot of fun. STARS’ heat section on Yoneyama had me giggling the whole way through as she proved to be the perfect comic foil. Whether it was being coerced into wearing a streamer headband or discovering that Xia Brookside’s legs are significantly longer than her’s, she was delivering the laughs. It also served as a nice re-introduction for Brookside who got to show off some of her wrestling skills before getting the win via an Iconoclasm into a clutch pin. 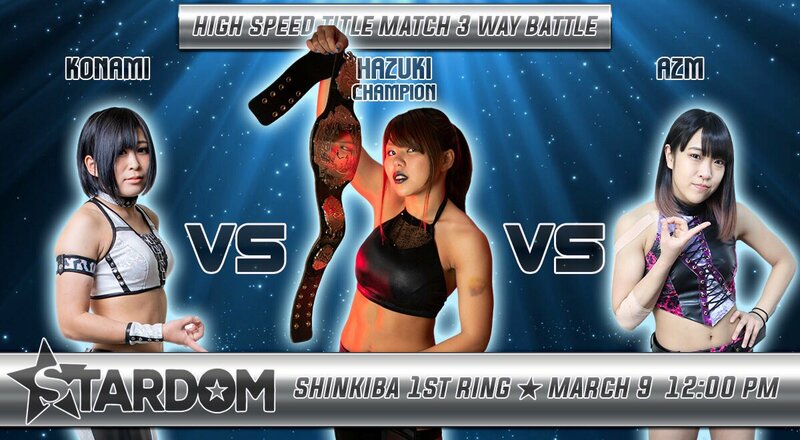 After the match, she challenged Hazuki for the High Speed title in a promo that was actually in Japanese. How good that Japanese was I can’t say, but it was still impressive. Tora then moved on to challenging Iwatani for the WOH Title, to which Mayu provided a somewhat confused response. Iwatani was attempting to explain that she has to defend the title in America next week (this was long enough ago that the match happened on Friday, review up soon), but if she manages, she’ll be happy to accept the challenge. It was, once again, hilarious. So yea, while I don’t think I’ll remember much about the wrestling from this match, I had a lovely time watching it. I imagine you will too. Natsu Sumire and her whip wrestled a surprisingly large amount of this match. I’ve mentioned in previous reviews that I enjoy Natsu, so I’m not complaining, it was just a surprise to see her so involved in the action against work rate heavy opponents. The second surprise was that not only did Miyagi pick up the win, but she pinned Momo Watanabe. Pretty convincingly too. There was no messing around; she dropped her on her head with a brutal looking piledriver before challenging her for the belt. You can’t say fairer than that. And seeing as everyone is challenging everyone today, Goya Kong then made her way out to challenge Kagetsu. It was an offer poor Kagetsu wasn’t too impressed about, even going as far as to ask whether she was allowed to say no. Sadly, that wasn’t an option, so the newbie is heading straight into the title picture. As for the actual match, it was good, hitting the level you’d expect on a mid-tier show from those involved. No-one was busting a gut to bring the house down, but they all impressed. There were some fun moments in this match, but it also summed up why I dislike three-ways. When you have three wrestlers working at speed, it becomes obvious that it’s been choreographed because otherwise, they’d all be bumping into each other. All wrestling has a degree of artificiality to it but a match like this takes that too far, and I struggle to enter the headspace required to enjoy it. On top of that, it was short. It felt like we were heading into the meat of the action when Hazuki rolled-up AZM for what was portrayed as a pretty simple victory. It’s possible that with some more time they’d have been able to do enough impressive stuff to get me on board, but they didn’t get the chance. Afterwards, Hazuki’s bragging brought out Brookside who restated her challenge, confirming that it will happen. Then, to keep the theme of the night going Natsu got into the challenging mood and called out Utami because she wants one of her belts. She didn’t seem to have decided which one she wanted, though, initially going after the Future Title which she isn’t eligible for. Sumire then asked for the EVE belt, but EVE is in charge of who challenges for that, so that wouldn’t work either. In the end, she settled for the Goddesses of Stardom belts roping Miyagi into being her partner. Anyway, that silliness aside, this wasn’t a bad match, and I like all three wrestlers. We’ve already seen AZM and Hazuki have a great showing, so hopefully, we’ll get to see Konami have another go further down the line. This wasn’t a star-heavy show as most of the matches hovered around the decent mark, but it was a joy to watch from start to finish. Everyone involved seemed to have a lovely old time, and it was hard not to get caught up in that. If you’re looking for an easy wrestling show to watch which will make you smile, this is the perfect place to go.